Born in Switzerland, Paul Klee studied music and showed great skill as a violinist. In his teen years, focus shifted to visual art. In 1898, Klee moved to Munich, Germany to study at the Academy of the Fine Arts. Klee explored color theory for the majority of his adult life. 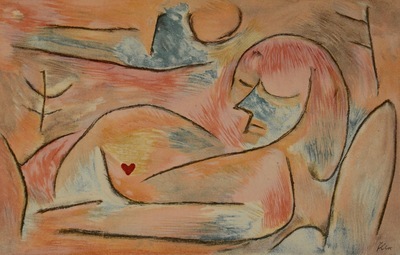 Klee’s work often reflects his dry humor and a childlike perspective. He was inspired by expressionism, cubism, and surrealism. This piece features thick simple lines with a plain woman figure. Bright contrasting colors can also be observed. These characteristics are also prominent in the other works he created during this time. This lithograph was part of a series which was published in the deluxe art review Verve in 1938. On the reverse there is a black and white lithograph by Joan Miro which incorporates Klee's name and the the title of the work.